RG Report Photos Album-Japanese-Everlasting Heroine 1980-2010! Wow!!!! here this Japanese blog you can see the introduction of this photos album! The cover is Zhenyaaaa!!! beautiful!!! <333 The 128 page book (ISBN978-4-16-008718-7) is available for 3,200 yen ($38). Also can ordered this book here (English Page), YESASIA is a very good on-line shop, I bought many DVDs and CDs there before. 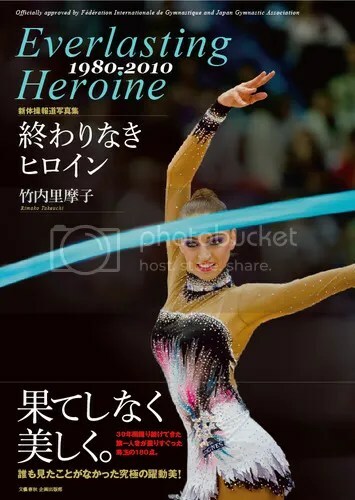 8 Responses to RG Report Photos Album-Japanese-Everlasting Heroine 1980-2010! My short impression about this book in Chinese! 小兔寶含封面大圖10張, 另+一張雙眼(WCH Mie09), 包子-4張大圖-EC10x1, World Games 09 x 2, WC Portimoa 09×1. Ira-5張大圖+2小圖年輕照片, Toma一張小圖-2000 Sydney, Kabaeva-3張大圖+2頁數張小圖, Daria K-3張大圖, Melitina-3大圖, Inna 1大2小, 維大師-數張大圖, 沒看到Moni, 但有BULgroup, Miteva-數張大圖. ITA Group一張大圖, Barsukova數張小圖, BUL Paisieva-數張大圖, Weber 2大, Bess 9大, 拉拉4大, 爬爬4大, 早期名將都有照片, Lip, Petrova, Timo, Kostina 等!!! Yes Yesasia is a good shop and even well known in Germany (for DVDs and games), because Yesasia pays the customs fees especially in Germany (!!!) and you need no credit card, you can pay with paypal. I have since few years an account. However, I haven’t ordered a long time, so I forgot my password *oops*. But I wait, what do you think to the book, Zoe. If it’s good, I buy it maybe. It costs 38,28 €, not very cheap…..
@b.angy: You can order this book in this on-line shop, the shipping is free!!! Beautiful album. do you maybe know how can I purchace it and have it sent to Greece? There is a shop in Taipei to purchase Japanese goods for clients, and it’s much cheaper than buying goods on amazon.jp!